Artificial intelligence and the transformation of production and work: towards inclusive prosperity? Brexit is the most important event in this nation’s recent history. Yet, I am tired of the Brexit debate. The difficulty is with the quality of the debate rather than with Brexit. The debate is partial, inward-looking and distorted. The economy has come to define Brexit in the same way that Bill Clinton’s 1992 presidential campaign was defined by the strapline – “The economy, stupid”. The economic aspects of Brexit are short-term as disruptive innovations will continue to destroy and replace firms and jobs. The policy debate that is perhaps more important than Brexit is the discussion and identification of a set of longer-term strategies that will transform this country’s economy. 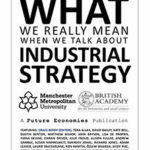 We need to continue the debate on the Industrial Strategy and on What We Really Mean When We Talk About Industrial Strategy. This blog considers artificial intelligence (AI) and the Industrial Strategy. It is worth placing AI in context. Between a quarter and a third of jobs and occupations that exist today did not exist thirty years ago. Many occupations have been rendered obsolete as the digital economy replaced the analogue economy and as the internet transformed both the world of work and everyday living. New technology is both a job destroyer and a job creator (Bryson, 2018), this has always been the case. What are the current inventions that will transform the world, which will impact on an industrial strategy? There are two ongoing transformations that are changing the world: AI and robotics, and developments in the application of platforms to economic activity. These are related innovations. The application of AI and platforms to production systems is destroying existing processes and business models. These represent disruptive technological innovations that will continue to create new forms of labour/firm displacement. The application of AI, including robotics and autonomous systems (RAS), to some types of labour represents the most recent reworking of the relationship between an evolving division of labour and technological innovation (Bryson and Andres, 2018). RAS are combinations of physical and software systems that can perceive their environments, and reason, adapt and control their actions. Developments in RAS are making it possible to automate tasks that previously could only be undertaken by people. There is much media discussion about RAS and its impact on work, but very few studies have assessed the potential impacts RAS will have on labour markets more generally. AI places more low-skilled jobs at risk compared to previous rounds of technological displacement. OECD analysis suggests that the risks related to AI in the labour market decline as educational attainment and skill levels rise (Nedelkoska and Quintini, 2018). The difficulty with these studies is that they say nothing about new tasks and jobs that might be created through the application of RAS. This is the ‘known unknown’ of the implications RAS will have on future labour markets. Another key issue is that AI and RAS are also one of the drivers behind the reshoring of manufacturing tasks back to developed market economies. The application of AI to manufacturing is transforming labour-intensive to capital-intensive tasks (Vanchan et al., 2018). It is worth revisiting finally two short essays written by John Maynard Keynes in the second year of the Great Depression: ‘Economic Possibilities for Our Grandchildren’ I and II, originally published in The Nation and Athenaeum. In these essays, Keynes reflected on the economic impacts of technological change for our grandchildren, introducing the concept of ‘technological unemployment’. His argument was that a ‘temporary period of maladjustment’ occurs in labour markets because of technologically-driven, disruptive change. But he noted that this was a temporary phenomenon, as technology would transform production systems creating new employment opportunities. What does this mean for the development of an industrial strategy? The answer to this is both straightforward and complex. The response is a simple one insofar as the pathway towards continued inclusive prosperity is founded on the ability of an education system to provide people with the training, skills and experiences that ensures that they avoid ‘technological unemployment’. Experience is an important element of this process, as AI may disrupt or remove entry-level positions, with the implication that employers will seek to recruit into more senior roles. This is not as simple as it sounds, since it means both a comprehensive educational system, from primary education onwards, designed to ensure that the UK avoids AI-driven technological unemployment. It will also need to include adult education and lifelong learning opportunities. Yet the UK seems a long way from establishing this wholesale educational infrastructure as a core, horizontal strand of an effective industrial strategy. It will require a very long-term and cross-party commitment.